Did you know you can take a local flight from Cancun airport to Cozumel in a jiffy? Forget about the ferry exhaustion and fly conveniently by Mayair. Thus, you save time and travel safely while enjoying a splendid view. Riding on 4-wheel ATV, horse, camel, and more. Sailing on a catamaran or sports-fishing. Gourmet dining on the beach. There is always something to discover in the Mexican Caribbean. Book in one of our Park Royal or Grand Park Royal Hotels. Taking your kids on vacation can be a lot of fun, especially if you are in the perfect destination. The Mexican Caribbean is full of fun adventures and recreational activities for you and your little ones. • Your kids will remember forever The Swim With Dolphins program, set up just for young children, and older kids can do the regular program too. • A popular outing with families of all ages is the Hummer Jungle Tour with activities like the petting zoo, ruins, a zip line, swimming in Cenotes, and the beach. • Selvatica Canopy Tour is an exciting family adventure with zip lines through the jungle. Family fun for ages 3 and up! • A trip to Xel Ha or Xcaret will keep the kids entertained all day long, and they’ll always love a day at Wet N Wild or Garrafon Park. • New to Cancun are Xplor Adventure Park, featuring zip lines, water landings, subterranean rivers, cenotes, and self-drive amphibious vehicles. It is taking Cancun by storm! • The Cancun Interactive Aquarium is a family-friendly activity that is popular. • The Jungle Tour is popular with kids, as are the ATV tours (at least for older kids). • The Subsea Explorer and Atlantis Submarine are unique ways to see the underwater world of Cancun without ever getting wet. Perfect for families with kids of all ages – they will be excited. It may sound obvious to mention, but the last thing you probably want to do when you are on vacation is to shop for groceries, cook and do the dishes. Your best bet when you travel with kids is to get the All Inclusive plan. This means that meals, drinks and recreational activities are included. Whereas choosing the European plan allow you to eat in the hotel’s restaurants but you’ll spend more money. Park Royal Cancún, Grand Park Royal Cancún Caribe, Grand Park Royal Cozumel or the Grand Riviera Princess offers the All Inclusive plan as well as a world of amenities and recreational activities. The only thing you’ll have to worry about is to enjoy. The beach is the ideal place to let your child dump, scoop, and pour sand and water to their heart’s content. They can use buckets and shovels, cups and spoons, or your hands; go on a scavenger hunt and collect rocks and shells. They can also build sand castles while you read a book sipping on a Margarita. Freshening up in the hotel swimming pool after a sand sculpture class will feel good. Take advantage of your Royal Holiday membership and plan a vacation in the Mexican Caribbean. For example, Quintana Roo is one of the most complete beach destinations in the world boasting pristine beaches, archaeological ruins, theme parks and an array of water sports. Riviera Maya and Cozumel in One Magnificent Journey! Royal Holiday travelers hit the beach all over the world. Some of the most fantastic beaches are on either side of the fabulous Caribbean sea that separates Cozumel from the mainland. What a mainland it is, too. The Riviera Maya is world renowned for wide, pristine beaches and some of the world’s most gentle and beautiful beach country. The Mexican Caribbean, as a whole, is always the most favored travel destination for Royal Holiday members no matter where they’re from. This offer is a double-dose – guaranteed to please even the most travel weary. All Royal Holiday members are welcome to book the Grand Riviera Princess as of May 1st 2014. And many of them already have. This special offer gives you a taste of something totally new – and a trip back to the tried and true at the Park Royal Cozumel! The Grand Riviera Princess puts up guests in Jr. Suites, or Deluxe Jr. Suites big enough for two adults and two kids. The resort boasts no fewer than 12 restaurants, eight specialty restaurants and four “munch-all-afternoon” buffets. That’s quite possibly more specialty fare than some guests will get to try in a quick vacation. Italian food, Spanish delicacies, Seafood, Asian and Mexican dishes are all served up fresh every day. The Riviera May beach is unmatched, unparalleled and almost too indescribably beautiful – but just as turquoise and clear as you remember in Cancun. The resort offers no less than 13 swimming pools, some in the shade and some in the sun. There are also nine tennis courts, organized activities and plenty of space for free-form fun. At night, the Areíto club stays open late for revelers and if you’re still not tired – just imagine a moonlight walk on a beach like this! In fact, a week at the Grand Riviera Princess is proving so popular, we’re inviting all members to mix it up a little. Book a week in May, June, September or October at the Grand Riviera Princess. 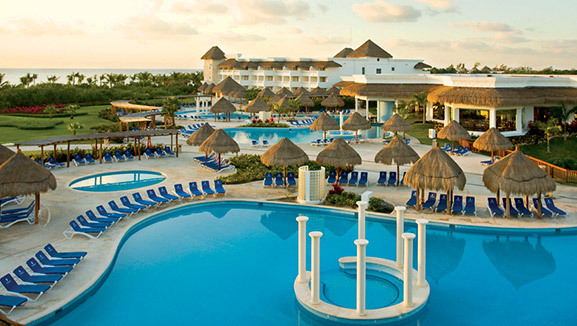 Then extend your stay for 3 nights FREE at the Park Royal Cozumel – just a ferry ride across the water. Or take your Three Free Cozumel nights – anytime in 2014. Or book 4 nights at the Grand Riviera Princess and take advantage of a 3-for-the-price-of-one offer across the channel at the Park Royal Cozumel. This offer is only for Members in good standing and must be booked prior to March 31, 2014 – for travel only in May, June, September or October of 2014. Call your Membership Services rep today. Subject to availability. * See the complete terms and conditions on Royal-Holiday.com. This offer is subject to availability and applicable only with NEW reservations. Not valid during Prime season, on long weekends or state holidays. All-Inclusive fee is billable for the total nights booked. 2 Free nights offer in Cozumel must be consecutive nights, but may be used before or after the reserved nights. 3 free nights in Cozumel requires All-Inclusive fee be paid for each night.